Earn 162 points upon purchasing this product. This liquid supplement is a blend of zinc sulphate and zinc chloride. Zinc sulphate and zinc chloride are highly soluble forms that have good bio-availability. Use 1624 points to purchase this product! Zinc is found in all tissues of the human body. It’s involved in a considerable number of processes and functions, either directly, or as a helpful presence. The metabolism of proteins, carbohydrates, lipids and vitamin A. Keeping the immune system working, reduces viral replication. Protein manufacture and the maintenance of healthy skin, hair and nails. Muscle growth and reproductive health. DNA synthesis and cell division. As an antioxidant, protecting cells from oxidative damage. The body is able to regulate its zinc levels so that within certain limits any excess is discarded; it only needs what it needs. A supplement is only required in cases of deficiency, or in cases of clinical need for a specific targeted application of zinc.The daily requirement of zinc is readily available in a balanced diet, including vegetarian diets, if they include wholegrains and pulses (such as beans and lentils). Deficiency should only arise through lack of sufficient sources in the diet, or through problems with the body’s capacity to absorb and use zinc. The UK recommended daily intake of zinc is 10 mg. 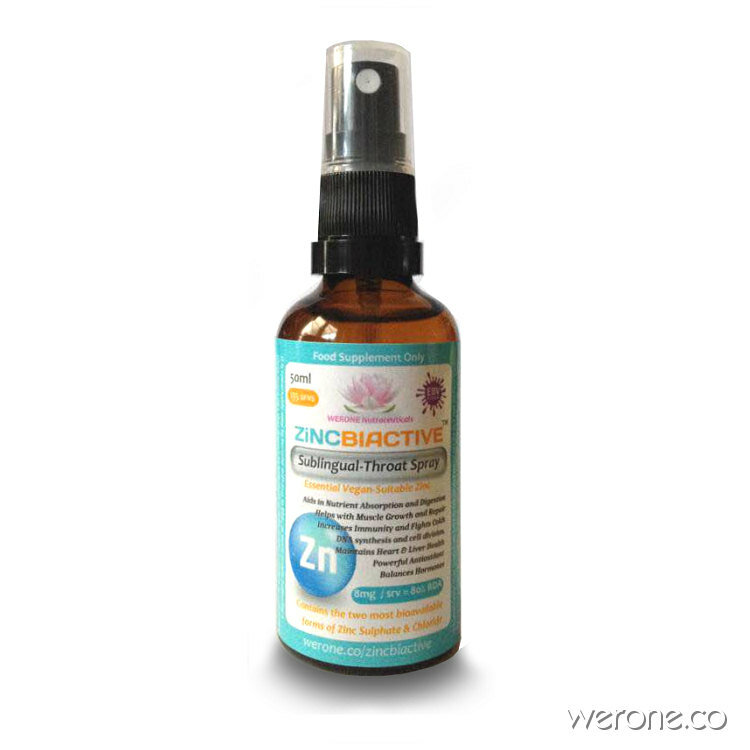 This supplement provides 8mg elemental zinc in each dose of 10 drops (3 Sprays). Zinc supplements are thought to be better absorbed if taken between meals. 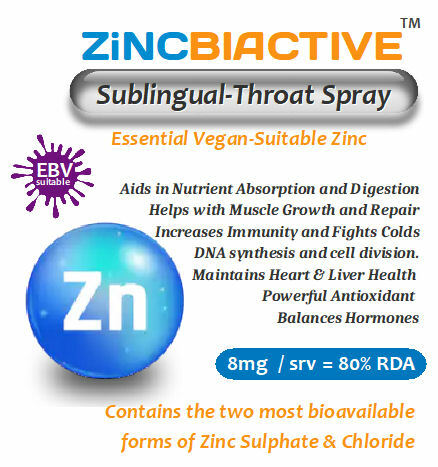 Suggested Usage: Amount Per Serving: Each 3 spray-serving contains: 8mg of Zinc (80% RDA). These statements have not been evaluated by the Food and Drug Administration or MHRA and the items are not intended to diagnose, treat, cure, or prevent any disease nor are they associated, endorsed, affiliated or sponsored by Anthony William or Medical Medium®. Thyroid Magic is a unique, all-natural combination of vitamins, herbs & minerals specially formulated to help an underactive thyroid (Hypo) and provide some support for the adrenals. Your thyroid controls how quickly your body uses energy, and controls how sensitive your body is to other hormones. BIOMagic™ is a broad-spectrum, multispecies probiotic formulation providing 7 well-documented species that may help support gastrointestinal and immune health, without prebiotics or polysaccharides for those with carbohydrate sensitivities or restrictions. This synergistic probiotic supplement delivers 750 million CFUs (colony forming units) of beneficial microorganisms per capsule to help establish and maintain a balanced, healthy intestinal microflora. AdrenalMagic™ can benefit everyone in stressful life situations. Contains synergistically balanced vitamins and minerals, herbs, and micro-nutrients. Supports the (hormonal) endocrine system which is the body's ability to metabolise hormones. California poppy is one of the oldest North American remedies for stress-induced maladies including sensitivity to changes in the weather. The above ground parts and roots of this wildflower show promise in the treatment of insomnia without the side effects and dependency risks of sleep aids. Higher doses of California poppy are sedating, lower doses reduce anxiety and lower stress. ATTaxa is a complex of 6 powerful extracts which may help reduce glycolysis by increasing AMPK pathway, reducing Hexokinase 2, VEGF and HIF-1a pathways whilst enhancing tumor suppressor pathways such as P53 & SIRT1. ATT stands for Antiglycolytic Tumor Therapy and may offer support for restoration of optimal metabolic functions to cells which have compromised respiration. DIM is a phytonutrient naturally occurring in cruciferous vegetables such as broccoli, cauliflower, cabbage, and kale. DIM (Diindolylmethane) promotes metabolism of estrogen by reducing it and aids in healthy hormonal balance. It optimises the ratio of crucial estrogen metabolites necessary in breast, uterine, cervical and prostate health. After Dinner Detox™ is nutraceutical formula containing a carefully designed mixture of nutrients & antioxidants to support and increase the levels of SOD, Catalase & Glutathione to neutralise the highly unstable free radicals which are created during the process of digestion, breathing and cellular metabolism.